"... it is a custom more honor'd in the breach than the observance." The procedure known as Environmental Impact Assessment (EIA) is a fundamental aspect of Environment Protection in the Planning Process required for any major development. EIA is a legal requirement for and a vital constraint on developments that have the potential to harm the natural, scenic and cultural environment. 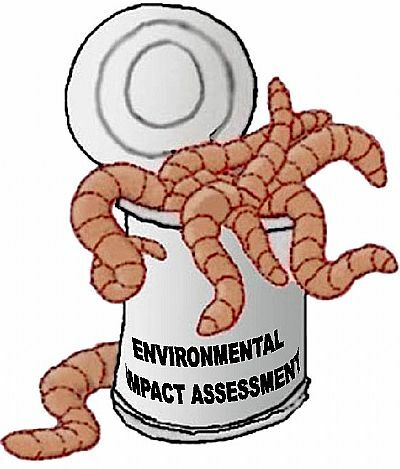 It's a very staightforward concept: Developers - and that includes aquaculture companies - are obliged to assess in advance any impacts their proposed developments might have on the environment. If those impacts are predicted to be detrimental, mitigation measures (including ditching the project) must be defined and devised before development is allowed to begin. EIA guidelines for proposed fish farms are clearly defined, yet they are regularly - by intention, indolence or incompetence? - being flouted by aquaculture planning applicants. Inadequate assessment of the environmental impacts of industrial development means, at best, sub-optimal protection for the environment. In aquaculture terms, this means willfully ignoring the ecological consequences of chronic marine pollution. Deficiencies in aquaculture applicants' EIAs are not being recognised by the planning committees that approve or refuse them because they do not receive the information/advice that would, if they were aware of it, enable them to appreciate quite how bad these EIAs, and the pollution impacts of fish farming in nets, truly are. Public consultation comment letters that convincingly (with evidence) expose these deficiencies are not being heeded by the planners who prefer to accept less critical, 'dilute' advice provided by statutory consultees. Aquaculture applicants are routinely presenting lamentably badly researched and reported EIAs which are not being adequately challenged by statutory consultees (who advise the planning officers who in turn advise planning committees) so that shoddily prepared and badly presented applications are being allowed through the planning process unhindered by rational appraisal. Supine acceptance of the appalling EIA documents that accompanied Hjaltland Seafarms Ltd's successful bid to install an extra-large (10 x 120 m) fish farm in Loch Snizort (Uig, Isle of Skye) forebodes a pessimistic outlook for the two Loch Eishort applications so vigorously and authoritatively opposed by the public and awaiting delayed committee decisions. We may hope that pressure from a well-informed public, plus considerations other than ecological factors will suffice to persuade the planning committee to refuse these unwelcome and potentially ecologically disastrous fish farm proposals. planning case officer and SNH, including the Chairman. HERE's the covering letter that went with it. Will any of them reply? What will be their response? What can we, the public, do next? According to the rules, NOTHING. There is NO PUBLIC RIGHT OF APPEAL if a fish farm the people do not want is given the go-ahead by the planners. In contrast, the applicant may appeal if refused. We must shamelessly and relentlessly draw our elected leaders' attention to their own, apparently intended-democratic, promises. If public servants, who are government (and, therefore, our) employees, tell us otherwise, we should make sure that those leaders know about it. BEWARE of what your mind tells you when politicians talk about 'Scottish Salmon'. They will be content if you automatically imagine wild salmon resident in Scottish lochs and rivers, heroically fished by tweed- and wader-clad anglers while they might actually mean salmon farmed in Scotland by Norwegian big business. They are very different versions of the same fish species.